Posterscope Netherlands has developed a special Out of Home network which can be used to reach millions of festival event visitors online and offline. The network will also include mobile geo-targeting based point of interest, location and time, and offer the possibility to copy Out of Home content to relevant mobile advertisements based on the weather, time, environment, social data or other festival triggers. Comms agency Taylor Herring has subverted out of home advertisers by making commuters wish they were tucked up safely at home, by anchoring the living dead to an ad installation in East London. A bizarre bit of experiential marketing for Thorpe Park is helping to promote two Walking Dead mazes based on the long-running AMC show. The attractions will be unveiled as the show hits its 100th episode In October, tying in with the Fright Nights season. The billboard was reportedly soaked in over 50 kilogrammes of animal organs and entrails to shock passersby. It is unlikely the gory ad format will be widely adopted by the industry but it inarguably provides a not-so-subtle alternative to online adblocking. The installation, which is mounted on a truck, will tour London henceforth. Some of the zombies got free from the billboard taking to the streets with sandwich boards and golf sale signs. Dominic Jones, divisional director, at Thorpe Park Resort, said: “Fright Nights is Thorpe Park Resort’s biggest event of the year, and we’re hugely excited to bring the worldwide phenomenon that is The Walking Dead to our visitors. The show provides a lot of room to play with in the outdoor space. Now TV in the UK ran a particularly strong prank utilising zombie CCTV in petrol stations. Further to that Sky ran an interesting VR bus stop to scare commuters. Can Graphic design save your life? This upcoming exhibition attempts to explore the relationship between graphic design and health. If your central advertising message is about saving people money, it can’t hurt to demonstrate cost-cutting measures around the ads themselves. 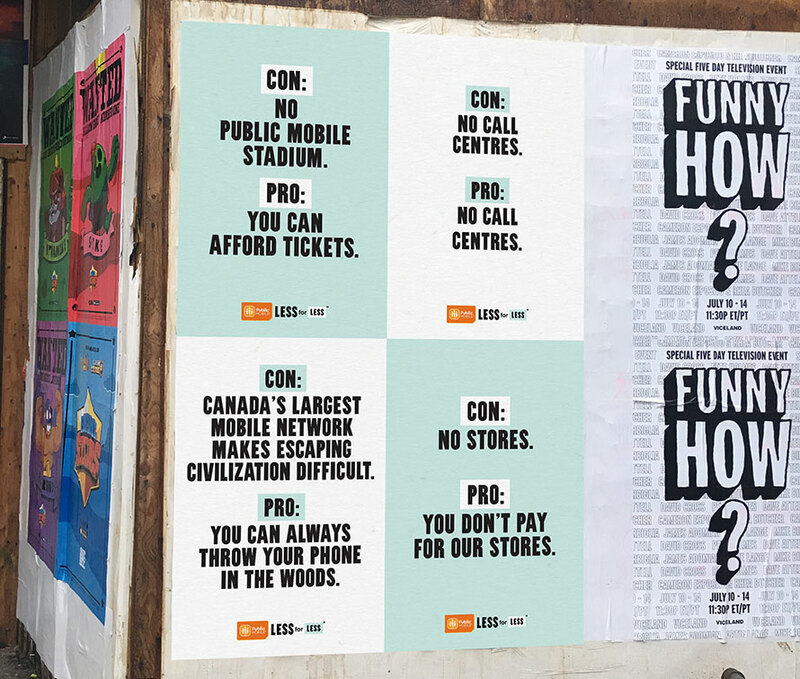 That was Cossette’s amusing approach in a new campaign for Public Mobile, the Canadian prepaid wireless brand. “We do wireless differently—no stores, no call centers, no overages, simple and straightforward plans, and loyalty rewards to earn even more savings,” says David MacLean, head of Public Mobile. The conceit was adapted across various media, starting with OOH with just a single billboard in downtown Toronto. 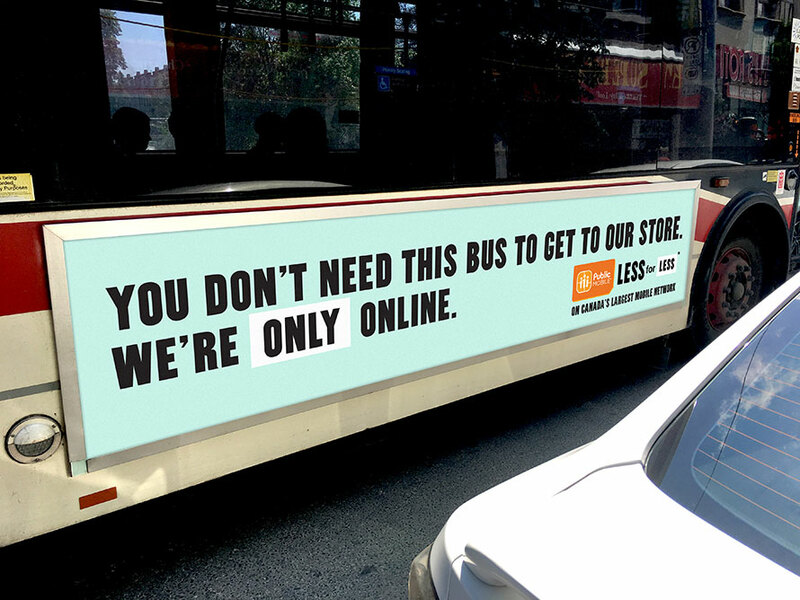 “This is our only billboard. We need it to say a lot,” the headline reads, followed by long copy explaining Public Mobile’s benefits. The campaign theme is, “Less for Less” and the billboard was supported by public transport ads and billposters. The brand also trimmed its budget for commercials and decided to run only the audition tapes of actors acting out scenes from the scripted ads, from paragliding to rock climbing. The actors weren’t in on the gag—they really thought they were auditioning for bigger-budget spots. You can watch the audition spots below. Renowned vodka maker Smirnoff appeared to take a cheeky swipe at U.S. President Donald Trump and the Russia scandal that has enveloped his campaign and administration. An ad featuring the brand poked fun at the special counsel’s investigation into the Trump campaign team’s contact with the Russian establishment. “Made in America,” declares a new Smirnoff billboard spotted by U.S.-based social media users, with a picture of a bottle of Smirnoff behind what appears to be a Moscow mule cocktail. “But we’d be happy to talk about our ties to Russia under oath,” the ad states. The brand, now owned by British drinks company Diageo, was founded in Moscow more than a century ago by Pyotr Arsenievich Smirnov, whose family fled Russia during the October Revolution in 1917. Ultimately Russia became Communist under control of Bolshevik leader Vladimir Lenin, and Smirnoff became one of the most well-known makers of Russian vodka outside Russia. Instituto Bola Pra Frente is a not-for-profit organisation in Favela do Muquiço, one of the most violent favelas in Rio de Janeiro, which is rife in gun related crime and drug trafficking. Their aim is to keep kids away from crime through sports and education. Despite this, many parents in the vicinity are unaware of the Institute and their work. In this poor, crime-ridden community, conventional media is non-existent. To raise awareness of the Institute and sign up children into their free spaces, bullet holes scattered across the walls of the favela were transformed into billboards. At the beginning of the year, 600 spots were available and quickly, 600 kids were enrolled. You can see the full campaign here. CVC, an operator and travel agent have just launched a campaign that reproduces famous tourist attractions with real size images. 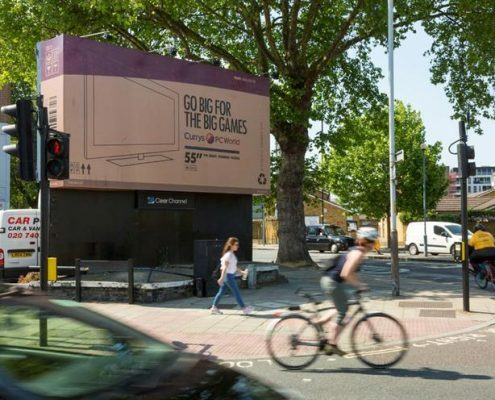 The OOH action was created by Publicis and the campaign’s goal is to arouse the public’s curiosity and the desire to travel, by emphasising the magnitude of monuments like the Eiffel Tower, the Liberty Statue and the Coliseum. Los Angeles will have a little more ink following the introduction of a new tattoo art installation in LA’s Silverlake neighborhood. The mural was created as a kick off to the Bulleit Frontier Works project. This is the first piece in a series of projects Bulleit will commission to celebrate and unite the thriving creative collaborator community in Los Angeles and beyond. The tattoo, which features Bulleit Frontier Whiskey’s iconic label alongside dozens of LA-inspired tattoo designs, was crafted by 24 tattoo artists who are locals of the Los Angeles area. The artists who contributed are people who have made a serious impact on the LA tattoo community. Each artist was given a section of the installation’s canvas to design and as a result every illustration carefully portrays Los Angeles in a way that is unique and personal to each artist. The sign took the tattoo artist over 90 hours to design and create. To celebrate the installation, Bulleit hosted a party to thank the artist for their support and contribution to the tattoo industry. A ground-breaking material hailed by medical experts for its ability to absorb harmful airborne molecules and disperse cleaner air will be launched today in Leicester Square. “The Breath” was created by a team of leading Italian researchers and has been rolled out across several European cities, including Rome and Milan, over the last three years. The material is now being brought to London as part of a corporate partnership between The Breath and media company Urban Vision. Urban Vision is to attach sheets of the air-cleaning substance to all of its outdoor advertising sites in the capital in a bid to remove damaging pollutants from the air. The launch of The Breath follows a series of alarming studies warning of the dangers posed by air pollution to Londoners. Last week a study commissioned by London Mayor Sadiq Khan found that tens of thousands of children in the capital’s schools are exposed to illegal levels of air pollution that can permanently damage their health. Another study conducted by Kings College London found that in 2010 dirty air contributed to up to 9,500 deaths in London. The same study estimated the annual economic cost of these health impacts was equivalent to £3.7 billion. Gianluca de Marchi, president of Urban Vision, said: “More needs to be done to tackle the scourge of air pollution. “I believe the use of innovative technologies such as The Breath will help to contribute towards improving the health of Londoners. The material uses a series of nano-molecules and the local atmosphere’s natural air flow to remove harmful pollutants such as nitrous oxides, sulphur oxides and particulates. The material can be used for both indoor and outdoor purposes, including for office workstations, classrooms and public advertising spaces. The Breath’s Italian inventors claim that once the material is installed it can absorb high concentrations of air pollution within a 25-metre area. By installing 250 sq/m of the material over a one-year period, The Breath’s inventors say its impact on the environment is the equivalent of removing pollution from over 750,000 unleaded vehicles and 300,000 diesel cars. The Breath, which has won a series of technological and innovation awards in Italy, was hailed last year by Professor Umberto Veronesi – the former scientific director at the European Institute for Oncology. In March 2016, he said The Breath was a good example of the benefits from the alliance between technology and science, which he said was important in helping to “win the fight in the treatment and prevention of cancer”. Initial tests from 1-4 Leicester Square carried out by Universita Politecnica delle Marche in Italy last autumn have proved to be positive. Using these initial results, researchers at The Breath estimate that just two 10 m² sheets of The Breath correctly positioned in the square over a one-year period could cancel out nitrogen oxide emissions from 5,475 diesel vehicles and unleaded cars. Similar to Posterscope and Carat Scotland’s 2015 coughing billboard to raise awareness of lung cancer, to most passersby, Åkestam Holst’s latest work for pharmacy Apoteket Hjärtat seems like an ordinary billboard. But thanks to in-built smoke detectors that react to smokers lighting up and smoking anywhere near it, when someone near the screen lights a cigarette, the billboard awakens. The model featured in the billboard then starts coughing before the smoker gets tips on various nicotine-products to substitute smoking.